Cold season is upon us! And I have been one of the unlucky ones who caught it this past weekend :(. I ended up spending some quality in my bed with a cup of tea and glasses of water as I nurse myself back to health. I think I was the only person who was stuck in a room on a beautiful day. One good thing about being stuck inside the house was being able to finally sit down and revamp my blog AGAIN!! It's been a few months since I planned to change it up, but if you have any experience in doing html coding in your blog on your own, it takes forevehz to get it to how you want it to look. My html knowledge is pretty basic, so my friend Google came to the rescue. But still, understanding the coding and which code affects what can get pretty confusing, especially if you don't know what you're doing! You see that sticky navigation bar on top? It took me almost two days to get it to where and how I want it. I'm pretty happy with how it looks right now. I wanted a sleeker and cleaner look, so the clutter had to go. I've also added a share this post button at the end of every post, so you can easily share my blog posts to your friends... because sharing is caring :D! 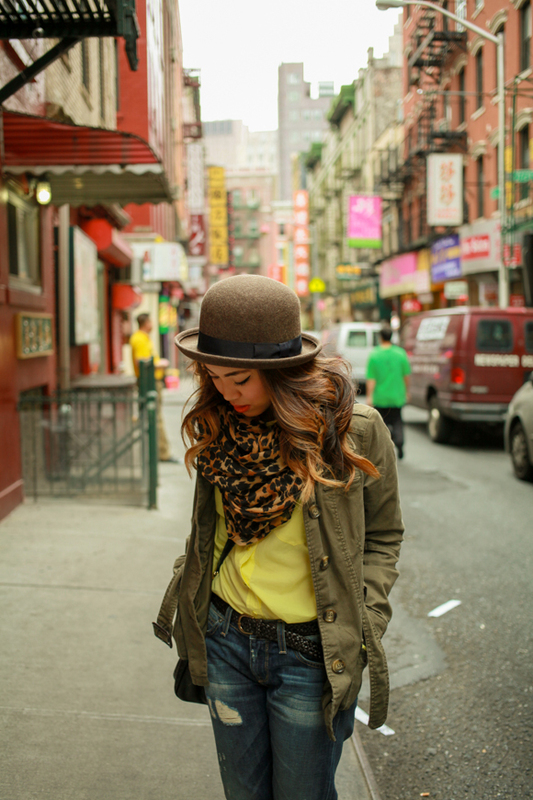 And now on to my outfit post, this was outfit numero dos during my New York trip. Day two of our trip was a bit gloomier with some light drizzling. I wanted to brighten up my outfit and the day by wearing this super bright yellow Equipment shirt. 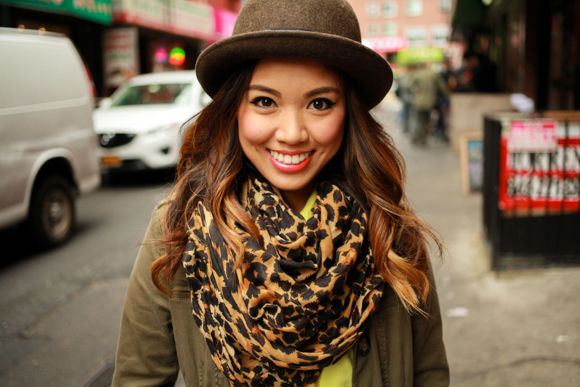 I also made sure to bundle up in my favorite leopard scarf and took out my new hat from Uniqlo to stay nice and toasty since it was also a bit windy. And what's good on a cold gloomy day? Juicy pork dumplings (or Xiao Long Bao aka XLBs) from Joe's Shanghai in Chinatown! We couldn't have picked a better day to go for some of their pillowy, soupy dumplings. If you ever find yourself in New York, make sure to head to Chinatown and go to Joe's Shanghai. It should be a tourist attraction on it's own. If there's one thing I really miss about New York, it's the dumplings. This is my sad face. Thinking about you my dear dumplings. 'Til we meet again. 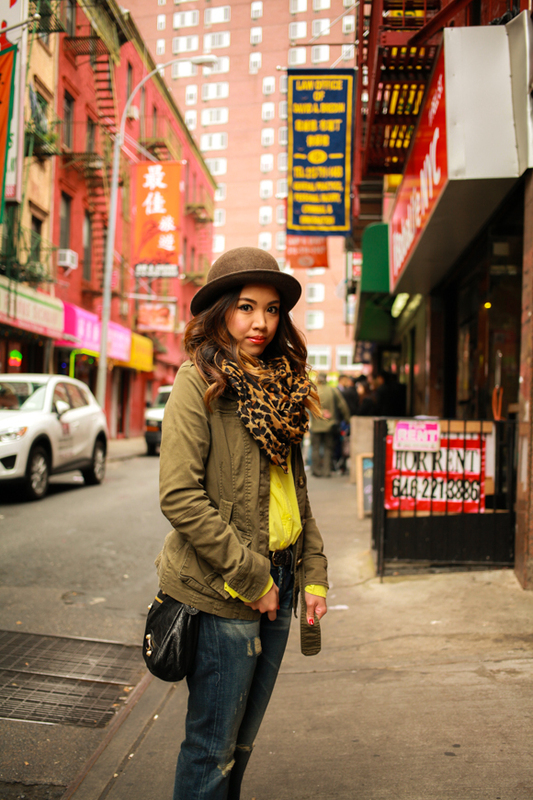 One thing I also love about Chinatown in New York is that... it's a pretty legit Chinatown. The original Chinatown in Los Angeles is not as good as the one in New York. The new Chinatown apparently is now in San Gabriel Valley, which I'm unfamiliar with since it's a drive from where I live. Chinatown in New York has the street carts with the mini sweet cakes and other $1 stick foods on the street. 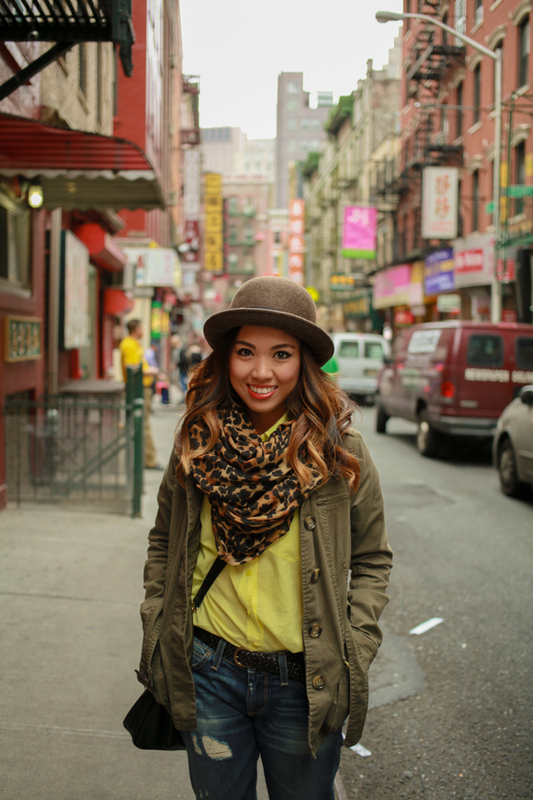 You'll also find the boba and tea shops and stores that carry knick knacks and New York souvenirs. The tiny alleyways with bright red paint with most of the signs that I can't read. And who can miss the knock-off designer things sold in every corner. The hustling and the bustling. Heck, even the smell of fish at the fish market! Not to mention, New York's Chinatown is pretty massive and has so much more options when it comes to food. Going through my New York pictures made me wee bit sad. I remember when I was back in high school when my parents took us on a trip to New York, I wasn't able to appreciate it as much as I do now (probably because I wasn't 21 yet). Even though I've gone multiple times and I end up in the same places, it's always a different experience for me. I think that's why I love coming here every year. 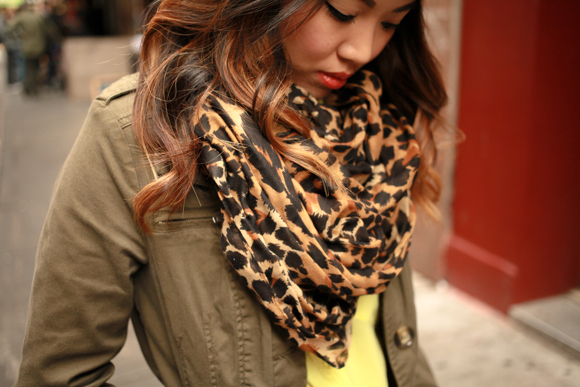 LOVE that leopard print scarf!! Thank you! 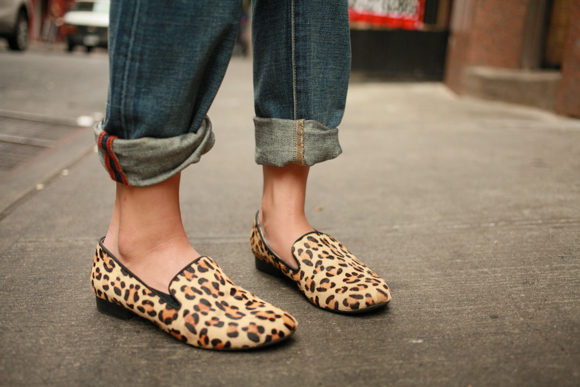 It's one of my favorite to wear for fall.